what is it about patchwork that is so compelling? some days i think that it is sheer genius. other days i'm convinced that i need an intervention. Trying to write a recap of the retreat last weekend is difficult. It really was oh-so-wonderful, just like everyone says it was. The group of women I was with was incredible. Quilters are wonderful people. Bloggers are wonderful people, too. 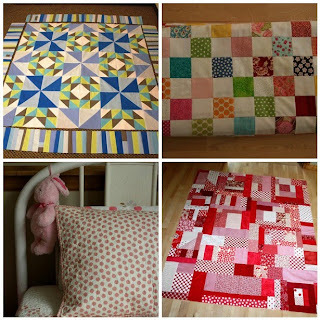 Quilt bloggers, well, they are the cream of the crop. I had met Victoria last year, so I already knew how lovely she was. It was fascinating to watch her work. I may or may not have fondled her bin of scrap fabrics more than is socially acceptable. She has a fun (albeit messy) approach to quilting. Her stars are beautiful! She brought her kitchen sink quilt for show and tell. What an impressive work of art. V also brought her Accuquilt Go! cutter so we could try it out. Talk about a slick machine! I'm not normally a gadget girl, but I think I may need one of these! Heather sewed with us for a few hours on Friday. What a humble and genuine woman. There were bolts of fabric that she designed sitting on the shelves at Gruber's, yet she was still hanging out with us normal folks, sewing quite unassumingly. She is also very generous. She donated a box of scraps to share...and my are they lovely! Thank you, Heather! Mary is sweet and kind and I secretly hope she adopts me as her 3rd child. Her authentic quilt is stunning! As is her Hope Valley quilt. Her and I had a chance to talk while everyone else went to the MN quilt show, which was lovely and comfortable, despite the fact that we had just met. She's the best quilt model I've ever seen, what a ham! Thanks to Mary, I'm now working on my applique project with the highly acclaimed straw needles. It's amazing how having the right tools helps so much! Shelly S...well she's a HOOT! You gotta love Shelly because you never have to wonder what she's thinking! She may be slow to pick up on teasing, but she's lovely all the same. Just don't smack talk against her beloved batiks or you may end up with your very own bag of scraps to take home. It was fun to pick her brain about machine quilting and to see her amazing work in person. Rene is sweet and kind and generous. What a wonderful woman! She makes a great roomie, too. She may snore a little bit, but she is dainty while doing it. (Sorry, Rene, I shouldn't be picking on you!) It was fun to get to know her better and we had, as she put it, some interesting discussions about quilting and blogging. She was working on a quilt that had me distracted. It's definitely going on my "to do" list. Terri is a fellow Wisconsin girl and she sure cranked out the quilt tops! Her fabric choices were gorgeous. She made us laugh! (If you ever lose your bindings, check your quilts!) I loved hearing her approach and thoughts on blogging and weight loss. So inspiring. It was fun to see her cute purse in real life, too...it is even more ADORABLE in person. Doris is a great dinner companion and one meticulous quilter. I could learn a lot from her! Her applique pieces are so precise! Plus, she has great taste in fabric. She made an adorable little baby quilt that made me swoon. It was seriously cute! Her and I are planning to do a little swap on the side that I am excited about. (In contrast to the batik challenge that I somehow got roped into. Sorry, Shelly, I can't stop picking on you!) 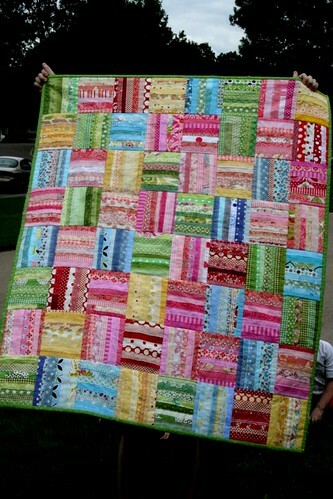 Doris and I live close enough that we may have a quilting weekend together in the not too distant future. Woo-hoo! You can tell that she is a retreat veteran...she had the slickest little setup with everything she needed right next to her sewing machine. Last but certainly not least, there is Andrea. What an all around pleasant woman! She celebrated her birthday over the weekend with us. She was my other roomie and my Saturday morning running buddy. Thanks again, A! She told the BEST inappropriate stories and was kind enough to retell them to those of us who missed them the first time. She also dropped some great one liners. What a funny girl! She brought fabric and chocolate to share with all of us. Thanks Andrea! Other highlights of the weekend included meeting up with my long time friend, Linda, for dinner at the Mexican Village. Yum! Both the dinner and conversation were so very wonderful. I also had the chance to take my dad out for dinner on Father's Day, which was great...I don't get to see him often enough. And I'd be remiss if I didn't mention my wonderful husband. What. a. gem. When I got home he and the kids were happy. The house was CLEAN. Plus, he didn't even flinch when I brought in my huge bag of new fabric. I love that man. Tonight I'm headed out to go on a weekend quilt retreat at Gruber's Quilt Shop! Victoria set it up last fall and it's finally here! Yipee! It's so weird to be making plans to go anywhere all. by. myself. I'm sure I will miss my family as soon as I leave the house, but I'm planning to enjoy every last minute. Seriously, how could I not? I'm meeting up with fellow bloggers to QUILT for the entire weekend! I've got my pile of projects ready to go...probably about 2-3 weeks worth. Overkill is nothing new to me! Speaking of retreats...I will be speaking at a few this year. The first one is going to be in Grand Rapids, Michigan for Margaret's Hope Chest at the end of July. You can read up on all the details here. I'm excited for this one! I have designed a quilt pattern especially for them and I will be showing several options to switch up the basic pattern. I'll be talking about color and fabric choices with a little bit of scrap talk thrown in, too. Margaret's Hope Chest is spreading HOPE in Jesus' name. I couldn't think of a better cause to quilt for. The work party is FREE! The majority of the sewing time will be spent making quilt tops for MHC. I think there are 10 remaining spots left. I'm also going back to Colorado this November to Inn at City Park, which is a beautiful Bed and Breakfast. More details on the retreat here. Of course, I am excited about this one, too! Tara is a fabulous hostess. Last year we had an AMAZING time. I know I gushed on and on about it already, but seriously, it was so. much. fun. It was my first quilt retreat ever, and it set the bar for all future quilt retreats VERY high. This year I will be teaching machine quilting: using both your walking foot and free motion foot. Last time I checked, there were only 8 spots left for this one. Heather is considering putting together a retreat here (in Western Wisconsin-just across the border from Minneapolis/St. Paul) but is trying to gauge if there is enough interest before she jumps in. Leave a comment on this post if you are interested. I also have a giveaway today!!! Up for grabs is a Roll Up in the Dark Colorstory, compliments of Robert Kaufman. I'm not going to gush about how wonderful Kona cottons are because I'm sure you already know. If you ask me, this would look lovely paired with Ash colored Kona cotton as a background for my quilt along. You know, in case any of you are still on the fence about joining in. :) Of course, if you are the lucky winner, you get to decide what to do with it! Leave me a comment if you want a chance at it. One comment per person please. I will announce the winner on Monday. I started quilting my house quilt over the weekend. I chose a fairly ambitious design. I hope that it doesn't kick this quilt into the "there-is-no-way-on-God's-green-earth-that-I-will-ever-finish-this-quilt" category. I guess time will tell. sew strips together in pairs, one background and one colored. 1/4" seam allowance will be used throughout this project. Press the seams toward the colored fabric. Repeat for all the remaining strips. If you are using scraps, charms or layer cakes, make 490 pairs of squares: one colored and one background square per pair. I was going to stop there for this week, but I was so anxious to get going on the assembly that I worked ahead a bit. Press the seam to one side. Now you have a little 4 patch, which is the center of your quilt. You can stand back and admire your handiwork. Isn't it cute? add the 4.5"x 2.5" pieces to the sides of the 4 patch. Add the 8.5" x 2.5" pieces to the top and bottom. That's where we will stop for today. We will cut the rest of our blocks next week. I was just so anxious to get that little center done that I had to assemble it right away. It's exciting to see the quilt start to take shape! As always, feel free to add photos of your progress to the quilt along flickr group. Thanks for quilting along with me! well, it's officially summer vacation. this probably goes without saying, but my sewing time is taking a hit. today i needed a quick start to finish project. i made 2 at once, so my camera is sporting a pretty new strap well. taking photos of it was the hardest part. man, do i love a quick project. and a useful one to boot! this little quilt has been in progress for about 2 years...i'm so glad it's finally done! to piece it, i used skinny strings that were too small to hold seam allowances, so i foundation pieced them onto fabric and left the edges raw. it's a little quilt, only 33" x 44". i LOVE the colors. LOVE them! and did i mention that it's all scraps? the backing....oh, boy! this has to be my best backing find ever. it came from joanns. can you believe it? as soon as i saw it i knew it was perfect for this. i love the simple green polka dot on the binding, too. to quilt it, i stitched in the ditch between the rectangles. i chose this option because of the extra weight of the foundation fabric under the strips. i didn't want to mess around with a lot of heavy quilting. a nice side effect is that the quilting makes a nice simple grid on the back, which you really can't see on the photo, but it's there. i love this little quilt and so does my daughter. she's amassing quite a pile of little quilts at the end of her bed. Welcome to the start the quilt along #5! I'm going to make this quilt step by step as I show the instructions, so there just may be some minor tweaking along the way. To recap quickly, we are going to be using 4 1/2 yards of background fabric and 10 fat quarters, or 20 fat eighths, or 2 1/2 yards of printed or solid fabric. Today we will be cutting up our fabric. From the 4 1/2 yards of background fabric, cut one piece 65" x wof (width of fabric). Fold the fabric lengthwise and cut into strips 2 1/2" wide. First, I cut 8 strips of fabric. At that point, I was nearing the crease of the fabric, so I flipped the fabric around, trimmed off the selvedge from the other side and cut 8 more strips. This left me with this center piece of fabric as a scrap. I did this because it seems to me that no matter how much I iron the fabric, the crease remains. It's easier to just work around it. From the 16 strips that measure 65" x 2 1/2", cut as follows. Cut 4 down to 64 1/2". Label and set aside. Cut 2 down to 56 1/2". Use the remainder to cut 2 pieces 4 1/2" x 2 1/2". Label and set aside. Cut 2 down to 52 1/2". Use the remainder to cut 2 pieces 8 1/2" x 2 1/2". Label and set aside. Cut 2 down to 44 1/2". Use the remainder to cut 2 pieces 16 1/2" x 2 1/2". Label and set aside. Cut 2 down to 40 1/2". Use the remainder to cut 2 pieces 20 1/2" x 2 1/2". Label and set aside. Cut 2 down to 32 1/2". Use the remainder to cut 2 pieces 28 1/2" x 2 1/2". Label and set aside. There will be 2 remaining pieces of fabric. You can set them aside as scraps, or you can substitute some of those for the next step. Now, from the remaining piece of yardage, cut 31 pieces of fabric 2 1/2" x wof. If you are using jelly rolls or yardage, leave the pieces as they are. If you are using fat quarters, cut them in half to make 62 pieces of 2 1/2" x 21" rectangles. You don't have to be exact or precise in the length here. All of your background fabrics should be cut. Next step, iron your fat quarters. I wanted to save the selvedges, so I trimmed them off first. Make sure there is about 21" of fabric to work with. Cut 62 strips 2 1/2" x 21". I didn't bother squaring up my ends for these strips as we will be strip piecing them. If you are using yardage or jelly rolls, cut or select 31 strips to use. I ended up having some cutting issues today, so I'm glad I had extra fabric. When it was all said and done, I had about 1/2 yard extra background fabric. Next week we start sewing! Please let me know if you see any errors or if you have any questions. Feel free to add your progress shots to the flickr quilt along pool. As much as I love free piecing quilts without a pattern, sometimes it's refreshing to piece traditional quilt blocks. This one is called the flock block. Each block finishes at 12". (Three complete blocks and one partial block is shown here.) When the blocks are rotated, it forms a neat secondary design. I made the block as I wrote a tutorial and I loved the design so much that I decided to keep going and make an entire quilt out of it. This is going to be for my youngest son, since he has been quite vocal about the the fact that there are way too many girl quilts going to the youngest member of our family. Such injustice in the world, I tell you. How do I join in the quilt along? That's a good question. I will post the instructions here on my blog, you quilt along. Feel free to show progress shots, as well as your fabric selections in this flickr quilt along group pool and on your blog. What size are the squares? 2.5" cut. Which means it's a jelly roll, layer cake or charm pack friendly pattern. If I am using jelly rolls, how many would I need? If I am using layer cakes, how many would I need? How many charm squares would I need? If I am using scraps, how many 2.5" squares will I need? Does the background need to be plain white? No, but I would recommend a tone on tone fabric or something extremely subtle. What fabric are you using for your background? I'm going to use white Kona cotton. Take note of the value (light, medium, dark) of your fabrics. If you use lighter fabrics, you will have a softer, more subtle quilt. If you are using brighter/darker fabrics, the pattern will have more definition and will be bolder. If you are using pre-cuts, try to choose the darks and mediums from the line. Or choose only the lights. If you mix in the light fabrics with the mediums and darks, you are going to lose the pattern definition in your quilt. Most pre-cut fabrics have a mix of values since it's a representation of the entire fabric line. So, to get around that, you could buy more than the required amount to work around the values or substitute in some coordinating fabrics. Scrappy is always good, right? Just something to think about as you are planning your quilt. I plan to start next Monday, June 7th. I'm glad that so many of you will be quilting along with me!